Smiling on the cover of Forbes magazine, was a woman named Sara Blakely, creator and founder of Spanx and the youngest-ever female to make the magazine's coveted "World's Billionaires List." Everyone who saw the issue wanted to know how this young lady turned $5,000 in savings and a pair of cut-up pantyhose into a billion- dollar brand in less than a decade… and turned herself into one of the richest people on the planet. It wasn't something broad, like "goal setting" or "self-discipline." But you may not have heard of How to Be a No-Limit Person. It's one of his first. One of the programs that catapulted him to international recognition as a one-of-a-kind teacher with a groundbreaking point of view — and the one that had such an enormous impact on Sara Blakely all those years ago. Wayne went on to become one of the great spiritual teachers of our time. But How to Be a No-Limit Person is a bit different from much of that later work. This program isn't spiritual. It's practical. Direct, down-to-earth, laugh-out-loud funny, and packed with some of the most useful ideas you will ever hear. But what about it is so profound, so original and life-changing, that 25 years after first hearing it, one of the wealthiest people in the world cited it as one of the things that got her where she is today? It all comes down to a very simple fundamental concept. This concept is not taught in school or actively promoted in our culture. So, not many people ever discover it. But once you do, you're changed forever. Equipped with something that makes you quite literally unstoppable. As you listen, your whole life opens up in front of you. You see opportunities you never knew existed. Everything looks different, more hopeful, better. So easy to be in control of what happens to you. So easy to never be in a bad mood or have a bad day. So easy to get exactly what you want in life, whatever it may be, whenever you want it. What does this program say that’s so original, profound, and life-changing? I could tell you that once you hear How to Be a No-Limit Person, you'll suddenly realize, with a shock, exactly what's been holding you back from whatever it is you want but haven't gotten in life. And in that same sudden moment, you'll know exactly how to eliminate it. I could tell you that it contains the ultimate secret — so amazingly simple once you hear it — to having the one thing we all want. Happiness. Real happiness, minute-by-minute, day-to-day, year in and year out, no matter what is happening around you. But I'm not going to try to "sell" you on this program. The truth is, nothing I can say about it can possibly do it justice. And I've made that easy for you. Just click on the link below and I'll send you the original, complete, bestselling How to Be a No-Limit Person audio program, so that YOU can experience its extraordinary, transformational message. Play it while you're driving. Listen while you're exercising. Put it on in the morning when you first wake up, or make it the last thing you listen to before you go to bed. If you don't experience a radical positive shift in your attitude, your outlook, your overall happiness, and what you realize is possible for you, simply return the program anytime within 30 days for a full refund. No questions asked. If you do experience that shift, then keep it forever. Maybe, like Sara Blakely, you'll listen to it all the time. Maybe you'll memorize every word of it. I can't promise it will turn you into a billionaire. But I can promise that whatever your dream is — a fulfilling career, a stronger marriage, more money, or even something as simple as more happiness — you'll know, with a certainty you've never had before, that you CAN achieve it. Because you'll finally know how. And maybe, in a few weeks, or months, or years, you'll be living that dream you're dreaming today and recalling your first encounter with this program as the day it began coming true. YES, I want to hear for myself the groundbreaking ideas that helped self-made billionaire Sara Blakely and thousands of others achieve their extraordinary dreams... and find out if they can help me achieve MY dreams, too. 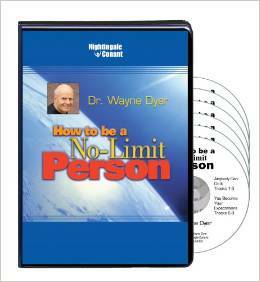 Please send me Dr. Wayne Dyer’s bestselling 6-CD audio program How to Be a No-Limit Person for just $49.95, which is $185 OFF the regular program price. Take advantage of this limited-time special discount now! If I do not experience radical positive transformations in my attitude, my expectations, and my outcomes, I can return the program in the next 30 days for a full refund. No questions asked.